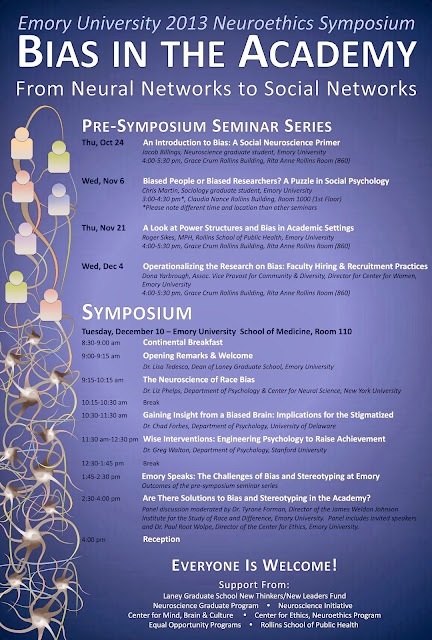 This neuroethics symposia is designed to discuss the complex influence of stereotype/bias on academia and apply advances in the science of stereotype bias to university policies and practices. Through a pre-symposia seminar series and symposia, a white paper will be produced to highlight challenges and to put forth practical solutions to move toward mitigating the detrimental influence of bias and stereotyping in academia. Titles and institutional affiliation for individuals who contribute to these seminar series are for identification purposes only. The opinions expressed are solely those of the speakers (facilitators or audience members) and do not represent the views of any organization that the speaker is affiliated with or with the opinions of any other author who publishes on this blog. The material contained on these videos represent the personal views of the individual speakers and do not necessarily represent the views of any organization that any speaker is affiliated with or with the views of any other author who might post on this blog.